View cart “MET-ILL – (Aprilla, Buell, Ducati, Honda, Kawasaki, Suzuki, Triumph & Yamaha) (NO BMW with integrated brake)” has been added to your cart. All Badlands Load Equalizer Modules are designed to provide you the ability to use small incandescent bulbs, Halogen bulbs or LED style turn (module operates both front & rear) signals without a rapid flash. A “rapid-flash” is caused by the factory turn signal module not seeing the specific amperage draw that the factory bulbs provided. 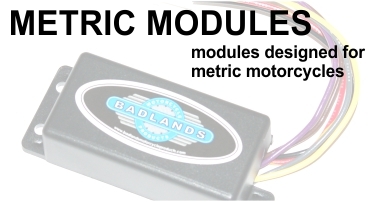 Badlands Metric Illuminator Modules are designed to provide you running light, brake light and turn signal functions to each rear turn signal all on (1) wire per side. These modules also have a built-in Load Equalizer which is perfect when switching out factory turn signals to Halogen or LED versions. This feature will prevent a “rapid-flash” which is caused by the factory turn signal module not seeing the specific amperage draw that the bulbs provided. The Badlands Illuminator Pro-III Metric Module is designed to provide you running light and turn signal functions to each of the front turn signals, running light, brake light and turn signal functions to each rear turn signal all on (1) wire per signal. The ILL-PRO-III-M also has left and right indicator light outputs for factory or custom turn signal indicator options. These modules are designed with a built-in 11-second Self Canceling feature which is perfect for all custom applications. Lastly, you do not need a Load Equalizer when using small incandescent bulbs, Halogen or LED turn signals (up to 50-watts per bulb or 200-watts total) since the ILL-PRO-III-M operates all lighting styles.